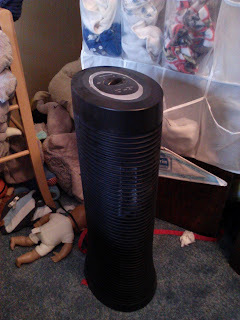 In our house, a quality air purifier is a MUST in every bedroom! It helps with allergy season along with cold/flu season and it especially helps when my family while we live with my in-laws and there are cleaners, dust, smoke, and other things that irritate our senses. Right now, my son is enjoying the benefits of the Honeywell True HEPA Tower Allergen Remover in his room! The Honeywell True HEPA Tower Allergen Remover captures up to 99.97% of microscopic allergens such as pollen, dust, smoke, and pet dander as small as 0.3 microns from air that passes through the filters. This high performance tower air purifier is ENERGY STAR® rated so you can feel comfortable running it 24/7. I love that there are three levels to choose from: the highest level is perfect for white noise at night and at naptime and the lower levels are great for quiet operation during the day! I also really love that it has an electronic filter replacement reminder that lets me know when I need to change the filter! Reminders are always great for busy parents! Buy It: You can purchase the Honeywell True HEPA Tower Allergen Remover for a price of $189.99 from the Kaz website. Win It: Kaz is generously offering (1) Honeywell True HEPA Tower Allergen Remover to a lucky winner!